Presents a $200,000 Donation to North Carolina State University’s Soldier to Agriculture Program, an In-Depth Career Introductions and Hands-On Training Program to Help Veterans Make the Transition from Military Service to Careers in Agricultural, North Carolina’s Top Industry. 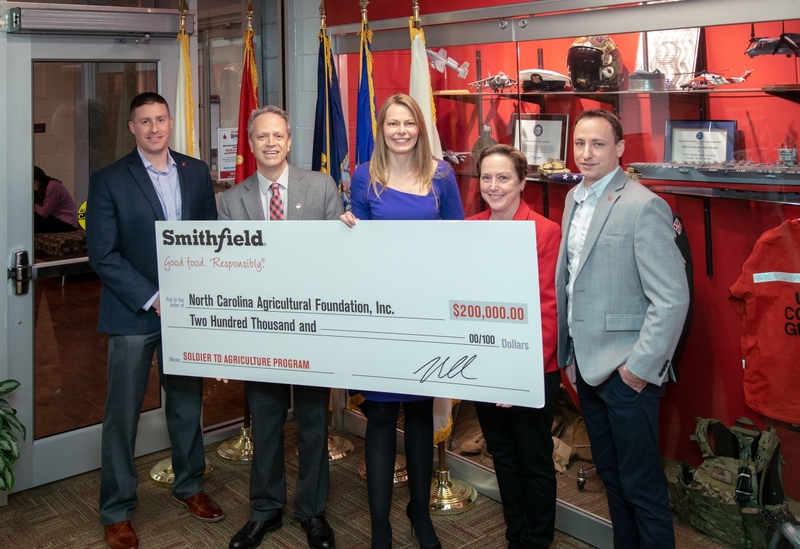 FAYETTEVILLE, NC., March 4, 2019 /3BL Media/ - The Smithfield Foundation, the philanthropic arm of Smithfield Foods, Inc., announced today a $200,000 donation to North Carolina State University’s Soldier to Agriculture Program (STAP), an agricultural institute that provides in-depth career introductions and hands-on training to help veterans make the transition from military service to agricultural careers, North Carolina’s top industry. The University’s Soldier to Agriculture Program is a partnership between North Carolina State University and the Fort Bragg military base career center, near Fayetteville, N.C. Smithfield’s contribution and partnership with STAP will provide a full year of funding for the program, enabling the build out of a larger facility and upgraded classrooms to recruit veterans and house agricultural courses and studies. Smithfield’s contribution will fund STAP from Mar. 2019 through Mar. 2020 to support it’s mission to create a positive and fulfilling career path for soldiers transitioning out of military service. For more information about Smithfield’s commitment to veterans and its local communities, please visit smithfieldfoods.com/helpingcommunities. The Soldier to Agriculture program at NC State University’s Agricultural Institute is a six-week program – held at the Fort Bragg Career Resource Center in North Carolina – offering an in-depth introduction to the many careers available in agriculture. Veterans exiting the armed forces can receive hands-on training, both in and outside the classroom. They will engage in discussions with industry leaders and farmers about agricultural business, marketing and sales, and various allied industries in need of career-minded individuals.